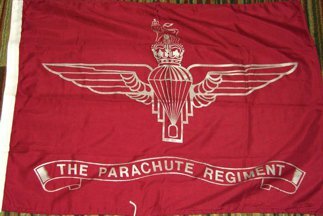 These are both British, souvenir-type flags related to the Parachute Regiment. 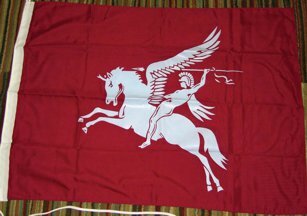 The top one depicts Bellerophon mounted on Pegasus, and the design was used as the 'flash' (arm patch insignia) by all Airborne troops from the Second World War until 1999 - http://news.bbc.co.uk/1/hi/uk/402130.stm. The lower one is similar to a flag sold by the Parachute Regiment for the use of veterans or soldiers' families: https://www.airbornepri.com/parachute-regiment-flag. Flag: Rectangle circa 42x29 inches (web photo image). 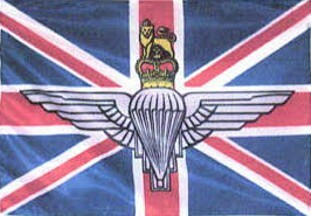 Union flag variant charged with the cap badge of the Parachute Regiment. "Image is printed on one side, and is visible on the other side (inverted)."